A day trip to discover what's all the fun about at this renowned world's cruise ships destination. 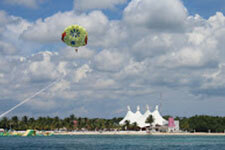 Enhance your Cancun vacation with a day trip adventure to the island of Cozumel. Frequent ferry service from the mainland makes it easy to explore the many attractions off the coast of Mexico on a day trip. Are you staying in Cancun on vacation? Venture away from the mainland and book a day trip to Cozumel - it's one of the most popular things to do for vacationers in Cancun. You'll find that the two destinations have very different personalities. Both have beautiful beaches, some of the best in the world. But Cozumel trades the glittering shopping malls, high-energy parties, and crowds of Cancun for a more laid-back lifestyle. Less hectic and busy, the island of Cozumel is known around the world as one of the top destinations for snorkeling and scuba diving. You'll still find plenty of restaurants and shops, but on a smaller scale than Cancun - think local dining spots and funky boutiques. 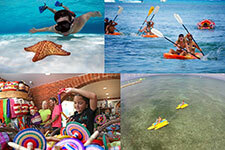 Discover all kinds of fun things to do in Cozumel. You can rent a scooter and cruise around the island, sign up for a snorkeling expedition, or spend the day at our award-winning water park. 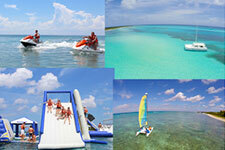 Playa Mia Beach and Water Park is the most visited beach location on the island and the largest water park as well. Enjoy more than 20 free attractions included in the cost of admission, including with the tallest and longest water slides, a fun floating challenge track, and a special pirate-themed area for kids. Getting to Cozumel from Cancun is easy; ferries leave frequently all day, every day. Book one of our packages and we'll provide roundtrip transportation to and from the ferry terminal here in Cozumel. It's the perfect way to make the most of your day trip to the island. Book your package today!